I'd just like to tell you a little about me. 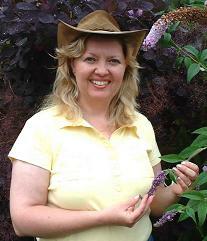 I am Alison Rosenbrock the co-founder of Design-Gardens.com. I won two consecutive gold medals at the Lifestyle Garden Show in South Africa for a Japanese and a cactus garden. I have also won the prestigious Elle Decoration WOW award. I realized that I had a passion for garden designs, which were in high demand. I then decided to put her talents to good use in the community by starting Southern Inspirations I later desided to go online and started Design-Gardens.com. Our company has produced and continues to provide high quality garden designs ranging from small flower boxes to estates of several acres in size. Professional garden designs cost from anywhere between $800 to $100,000+; the average family cannot afford these services. Design Gardens also provides pre-made designs that enable anyone to customize and install a professional design for their garden - for as little as $37. Digital design copies in multiple formats (JPEG, Vector PDF). Vector graphics enable zooming to over 1000% without loss of quality. A customization guide provides step-by-step instructions on adapting the pre-made design to any garden. An installation guide including step-by-step instructions for installing key focal points, hard landscaping elements and plants. An optional DVD walk-through can be shipped (not available for download). One-to-one correspondence with a professional designer who creates designs from scratch according to the customer’s specifications. Customers can choose from multiple concept designs before selecting a final plan that may contain elements from any of the concept plans. The final plan is digitized (printable up to A2), and a virtual walk-through of the garden is provided on DVD. Irrigation and Nightscaping plans are available as optional add-ons. Customers can also request to have the garden installed for them for an additional charge. Well that is enough about me and design-gardens.com. Contact me if you need more advice or just need to clear something up about my site.